The 7-11 reference is to a 7″ rise and 11″ run. 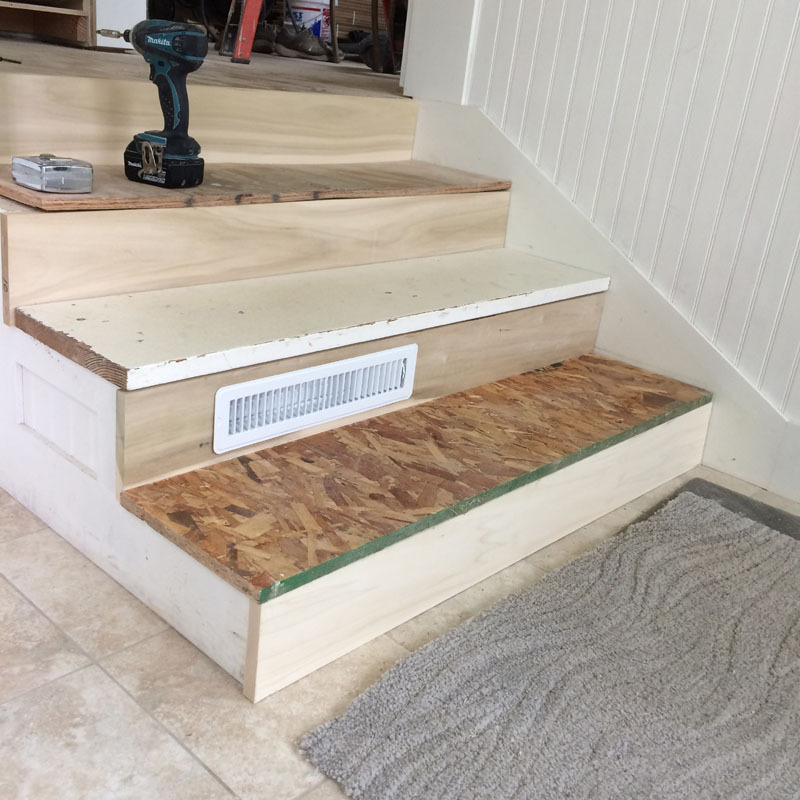 My goal for a nice usable staircase. 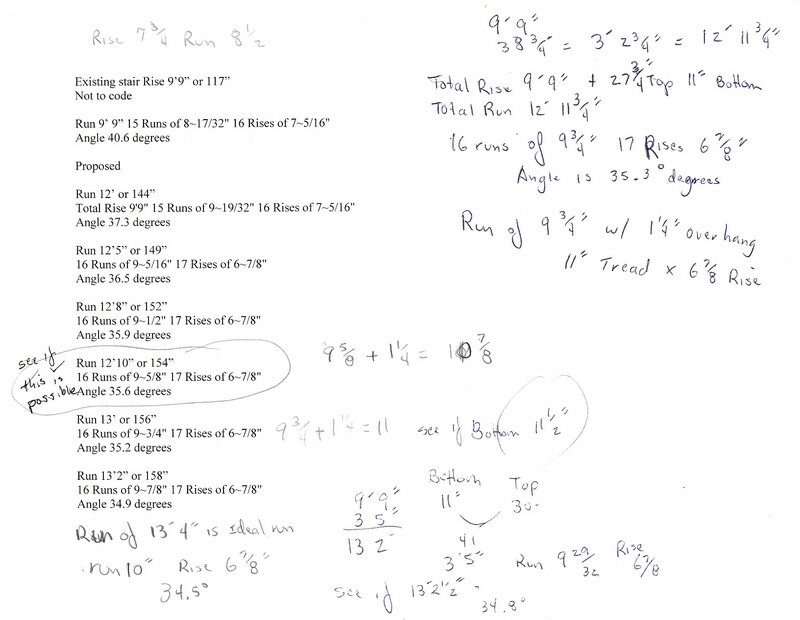 For your notes most stair builders figure R (rise) + TW (tread width) should equal 17″ to 18″. 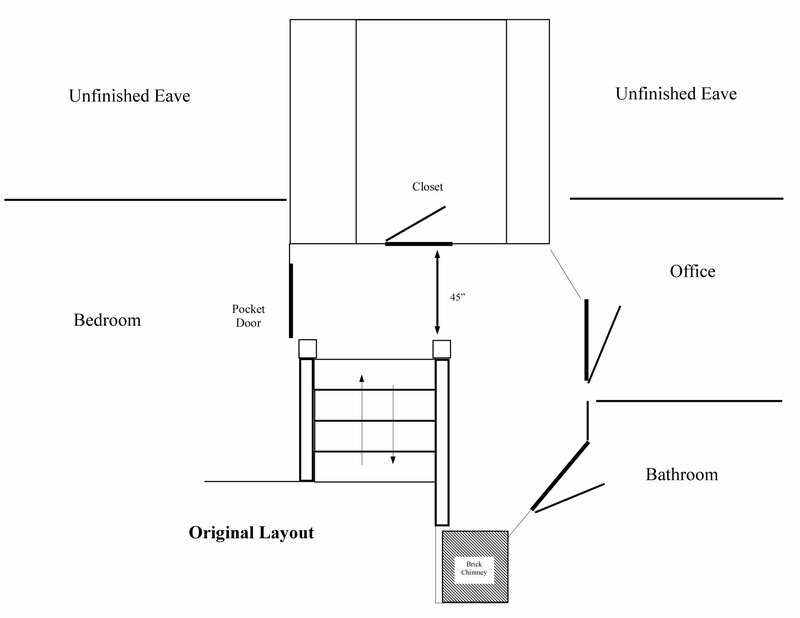 The very first thing you should do is take a look at the SMA (Stairway Manufacturers’ Association) Visual Interpretation of the International Residential Code for stairs. 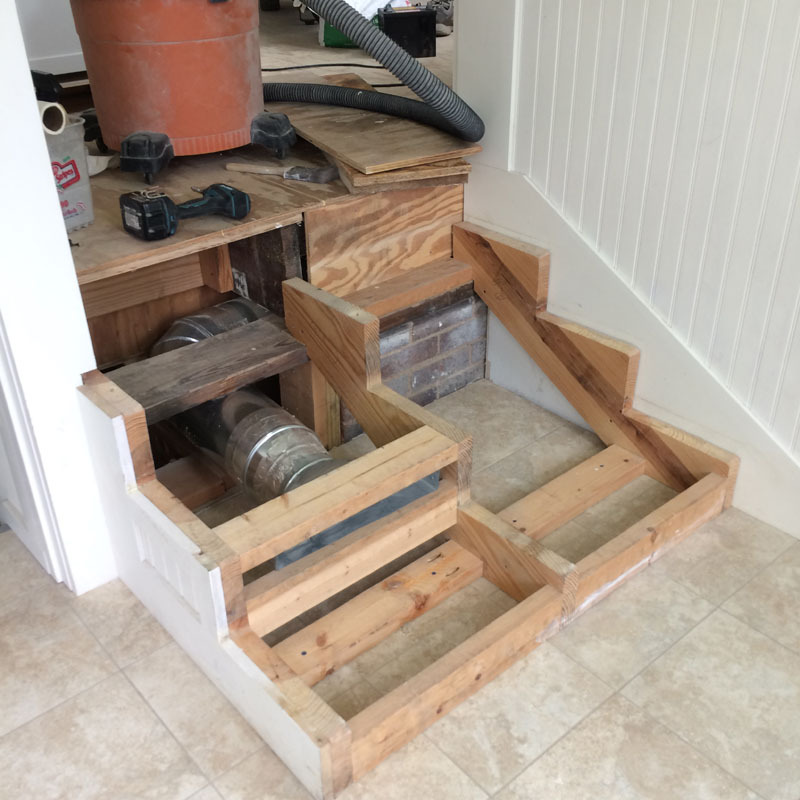 If you’re going to modify your stairs, you might as well do it to code. There are lots of resources on the web for stair building – this Stair calculator will help a lot. There are some basic terms that you must know and they are always going to be with you – like them or not. 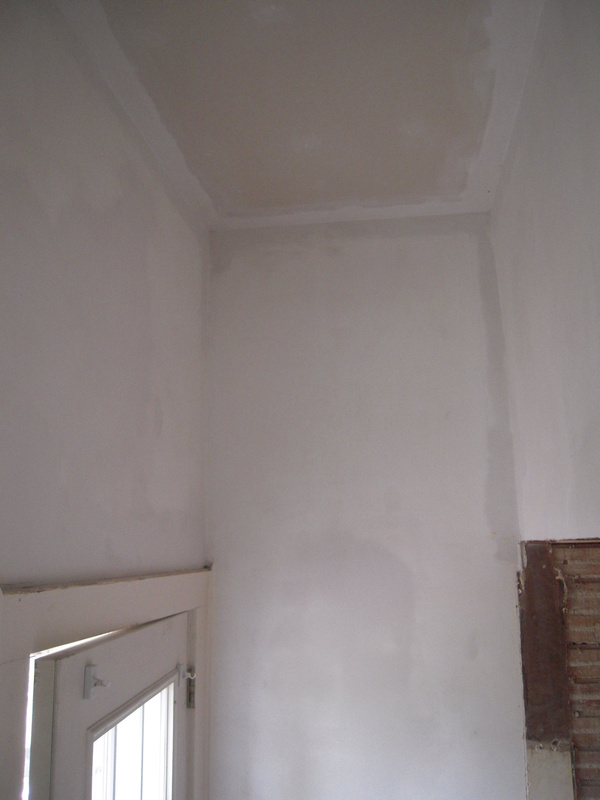 Rise = this is the elevation from the 1st finished floor to the 2nd finished floor. 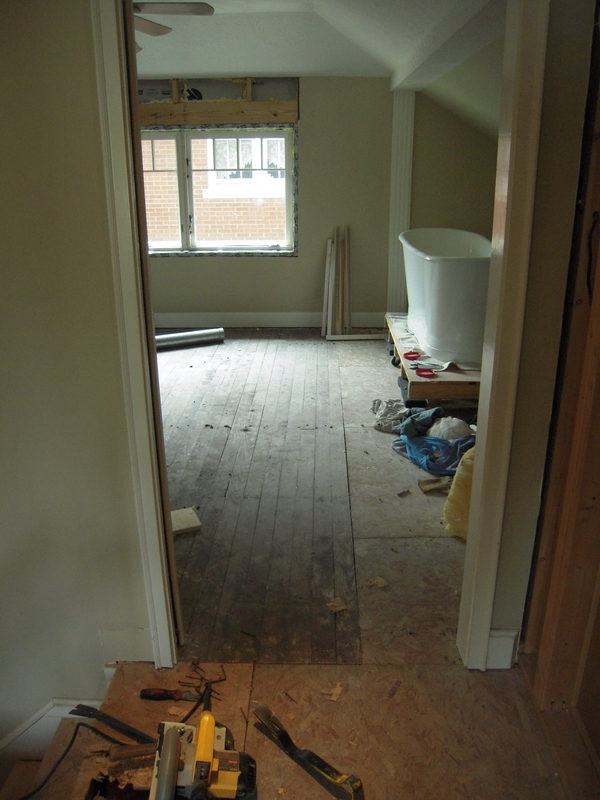 It will not change – you can’t make it change – unless you add inches to your 1st finished floor. I say finished, because you must know the measurement of the total rise. Not a guess, not an estimate – the exact measurement. 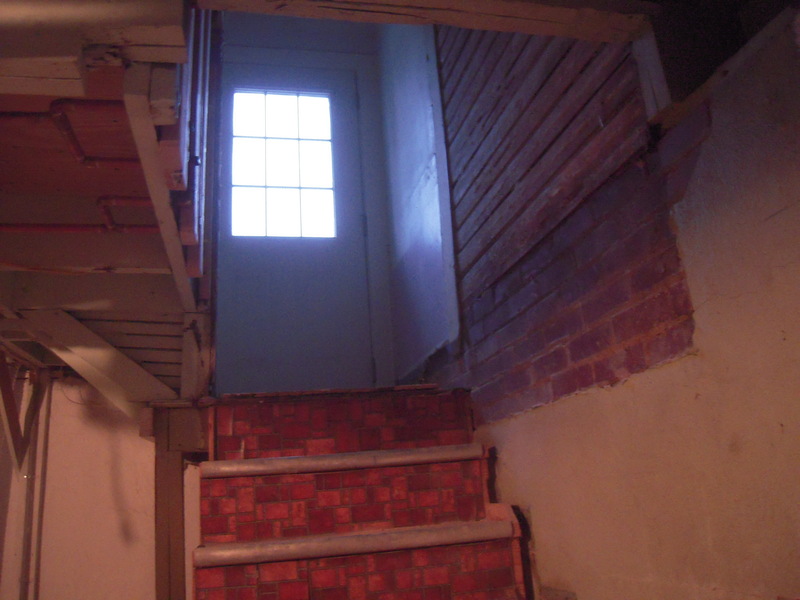 We want a good staircase that won’t hurt us, right? Run = This is the length of the staircase. 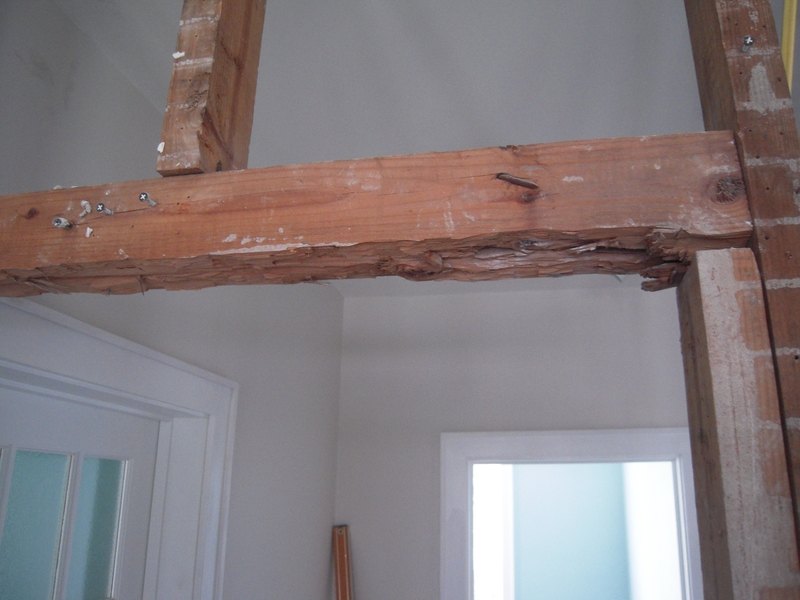 It’s the problem that most of us old home renovators struggle with – the longer the run the more options we have. We like to have an unlimited run – we would be free to have that stairway to heaven. Well, almost. 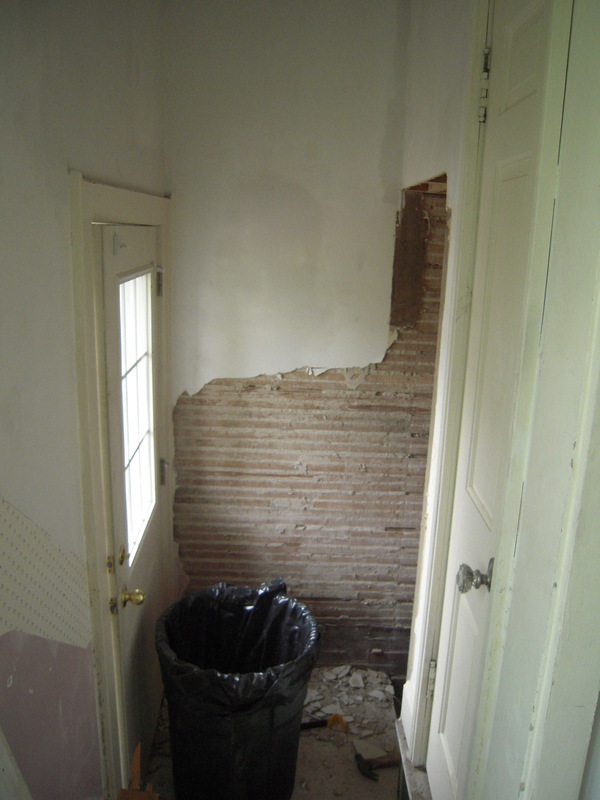 Headroom = This is the other obstacle that old houses face. People must have been really short back then. 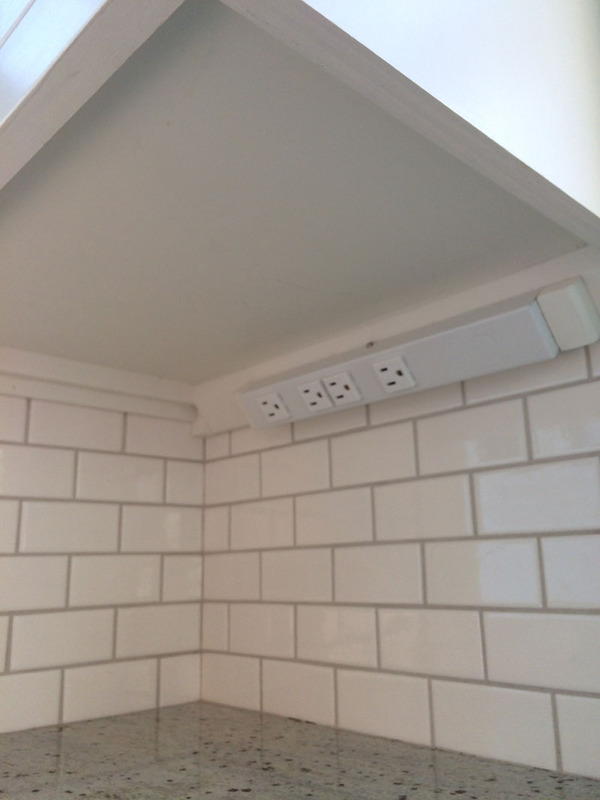 You need a minimum of 6′ 8″ clearance. So let’s see how I solve this puzzle. 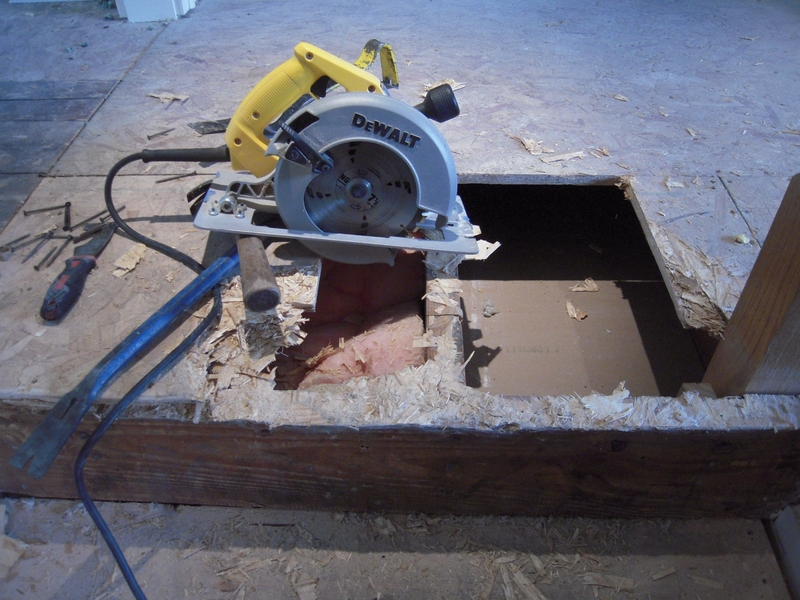 Let’s start with the basics of my problem stair case. 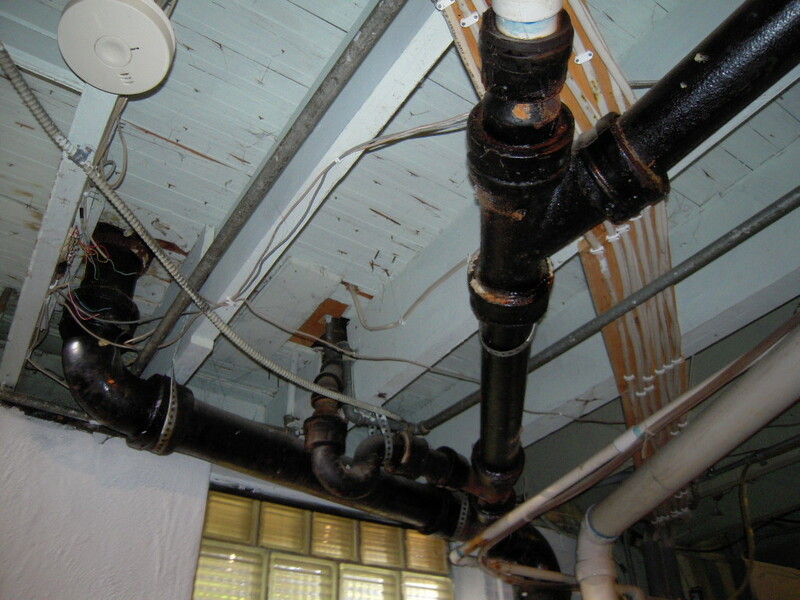 Rise 117″ or 9′ 9″ Run 117″ or 9′ 9″ these are measurements you really don’t want in a staircase. This gives you a crisp 45 degree angle of incline. Can you say stairmaster? Remember we have got to find more run to make the stair work. We can’t do anything about the rise. It’s 117″ and will always be. 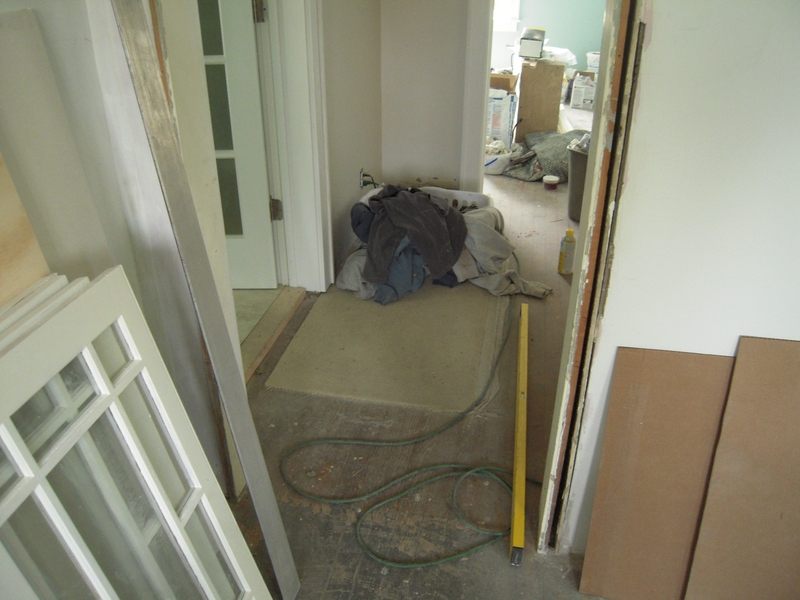 The bottom of the stair is in direct line with the only finished room in the house – the bathroom. 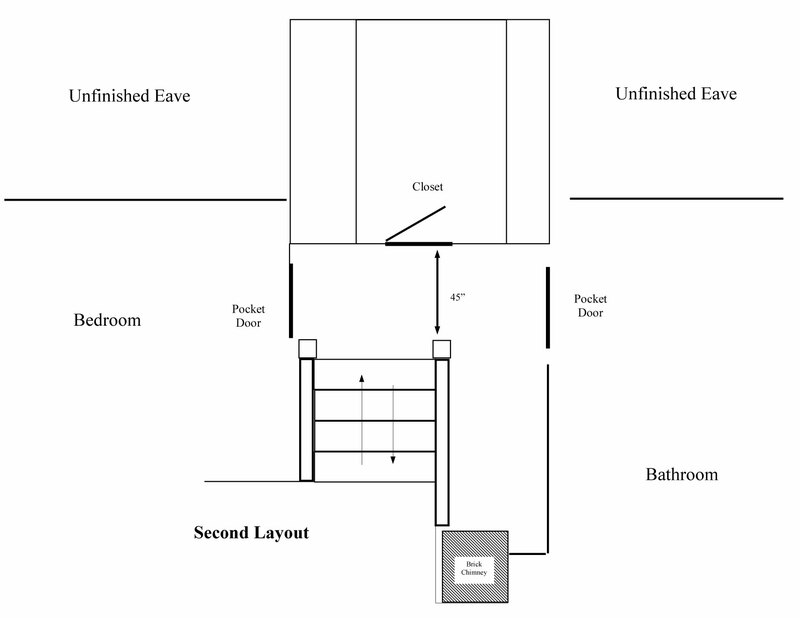 The landing requirements by code are the width of the stair tread, in my case that’s 36″ The yellow level on the floor is at 42″ to the bathroom door, so we should be able to gain a few inches for the run here. Let’s put 6″ in the “New Run” bank. 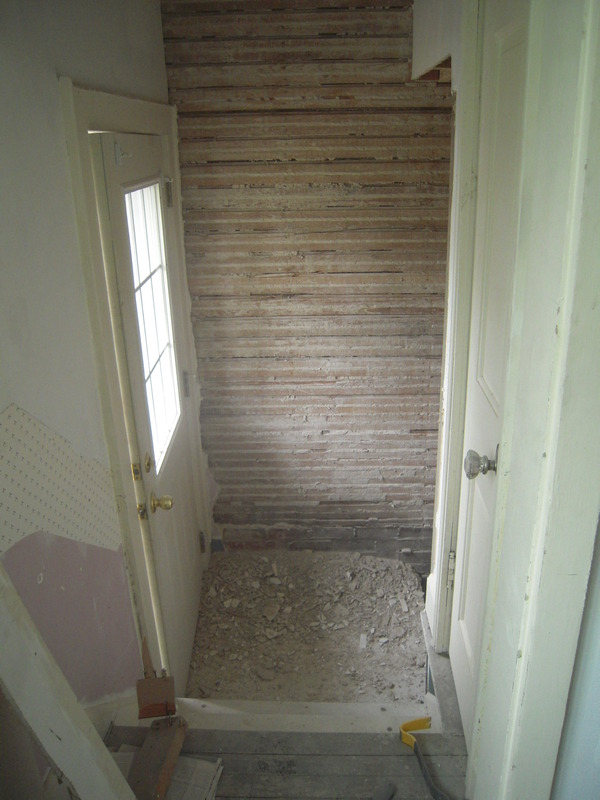 This is the original layout at the top of the stairs. 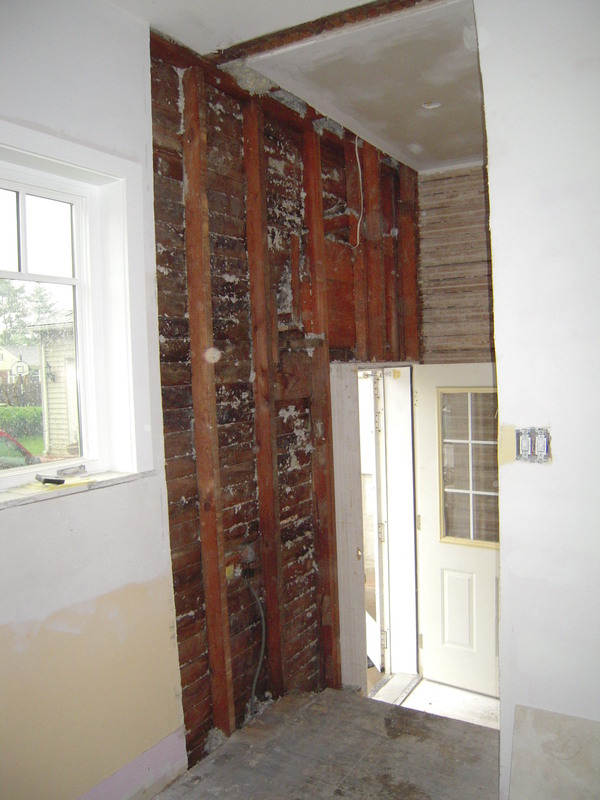 We have 45″ for stair to closet wall. 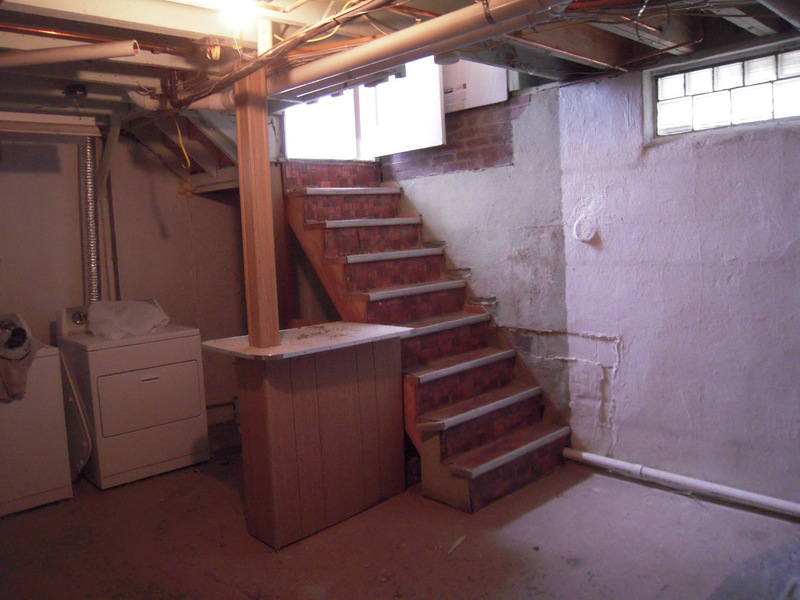 It’s adequate now – but we need like 30″ of additional stair up here. Yikes! 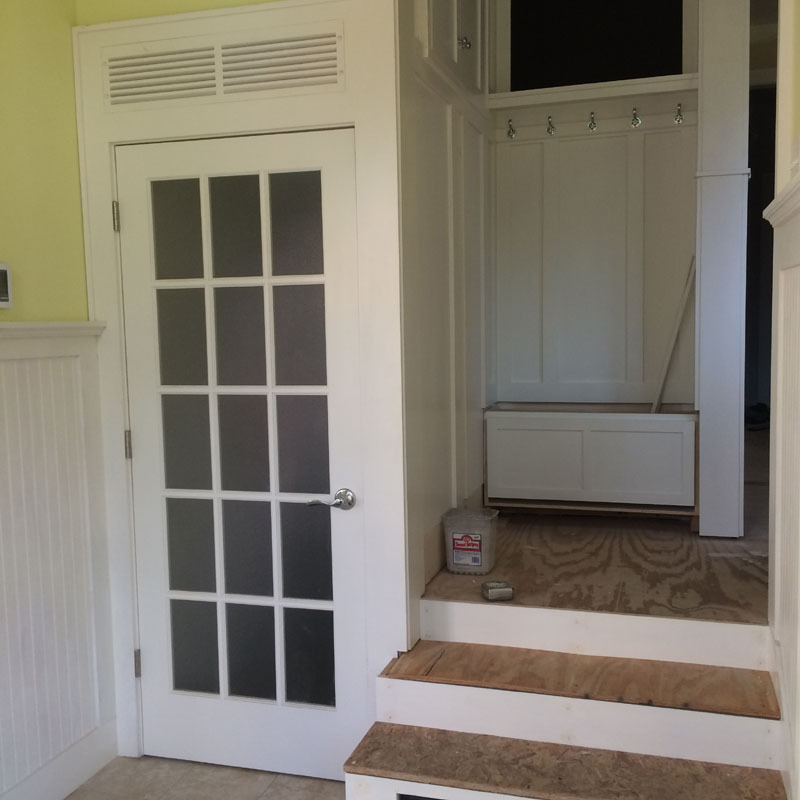 You can see that the pocket door entering to the bedroom is at the top of the stair run. 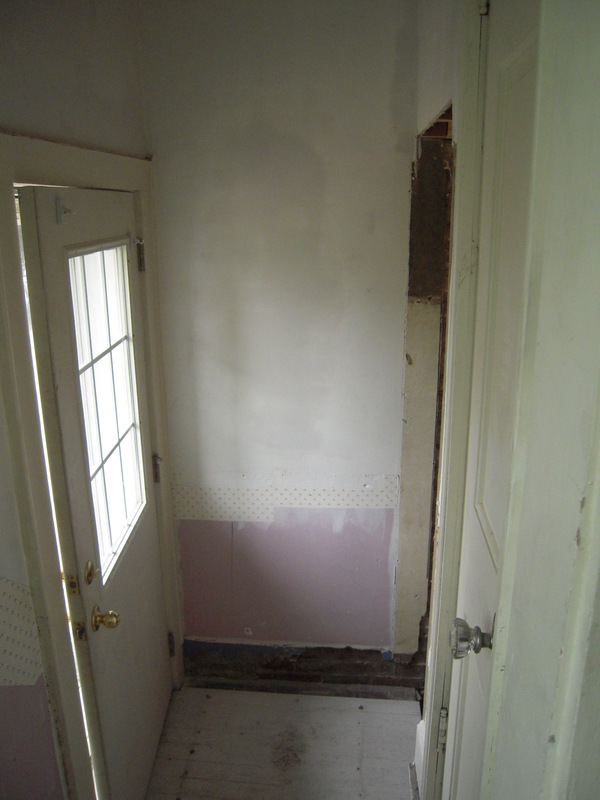 To the right you can see the closet wall. 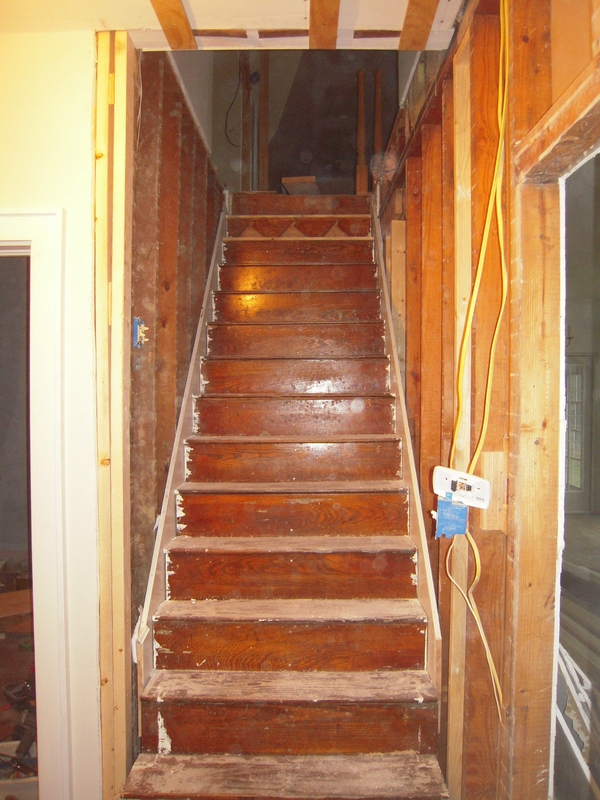 We will have some major changes to make this a workable staircase. So let’s get a saw out and cut something! A little investigational surgery to see what we can do to get more “Run”. 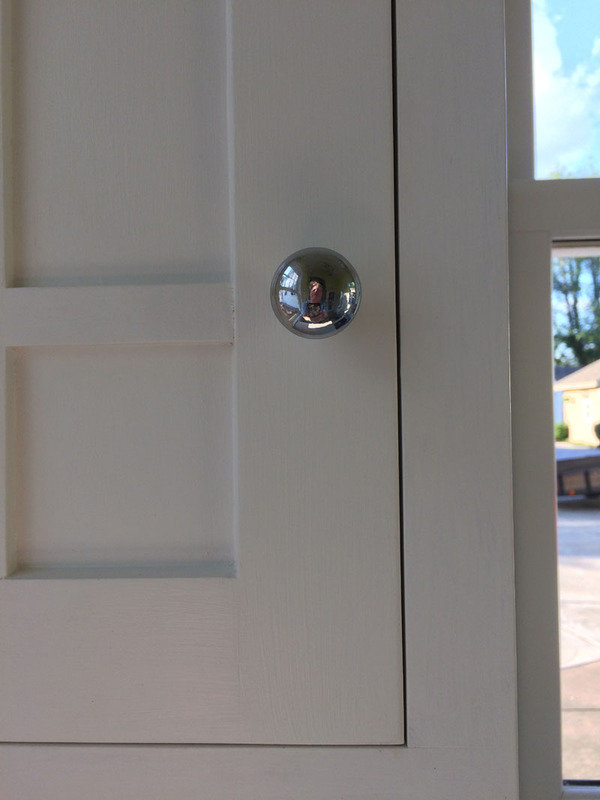 This is looking into the bathroom. 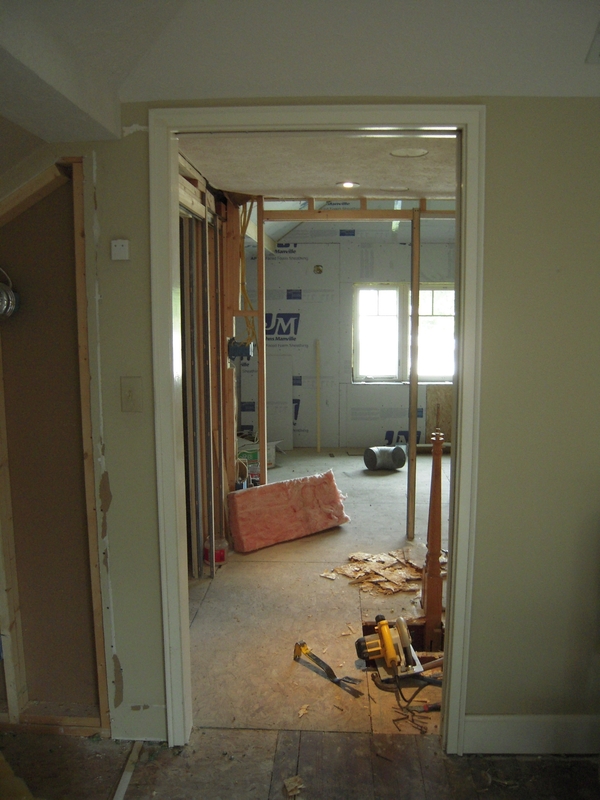 Of course I had just finished the walls for this area – new closet pocket door and reconfiguration of the bathroom layout – then I decided to tear it all out and put in the staircase. 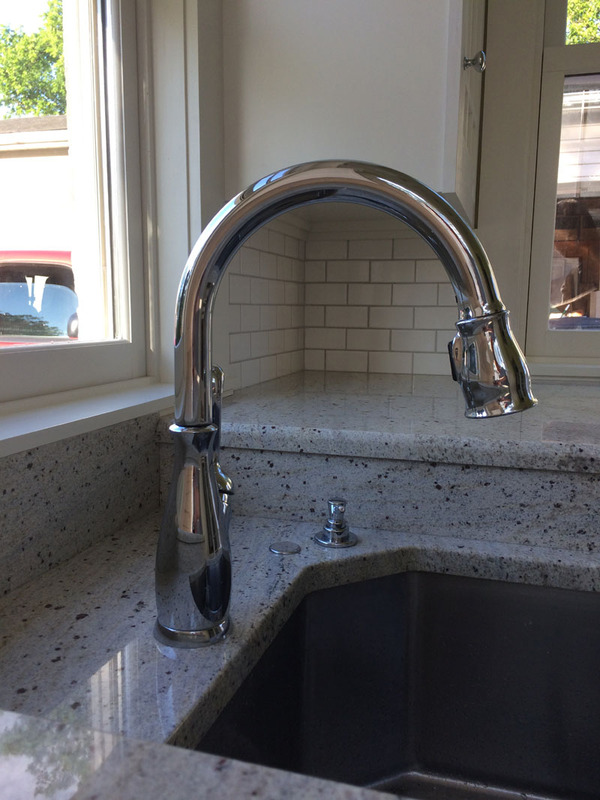 As I have lamented many times – freestyle renovations has its consequences. 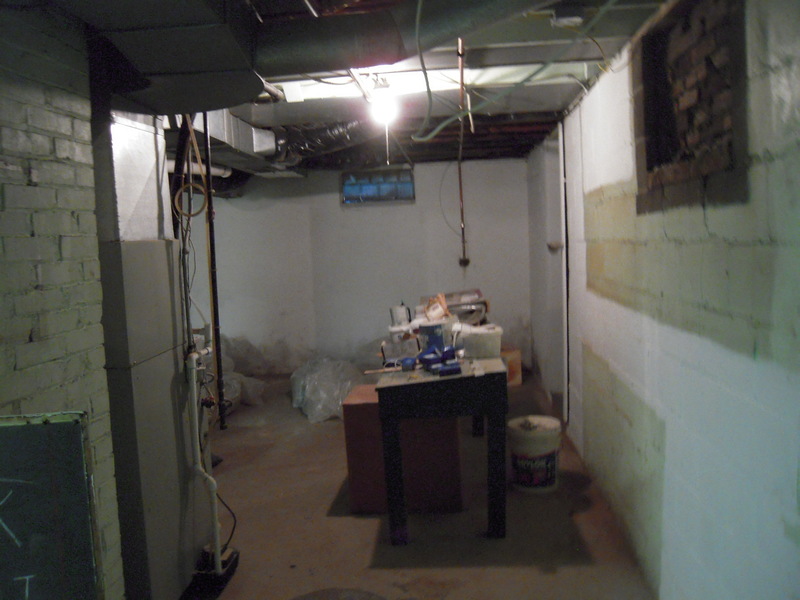 This was the second layout of the upstairs. 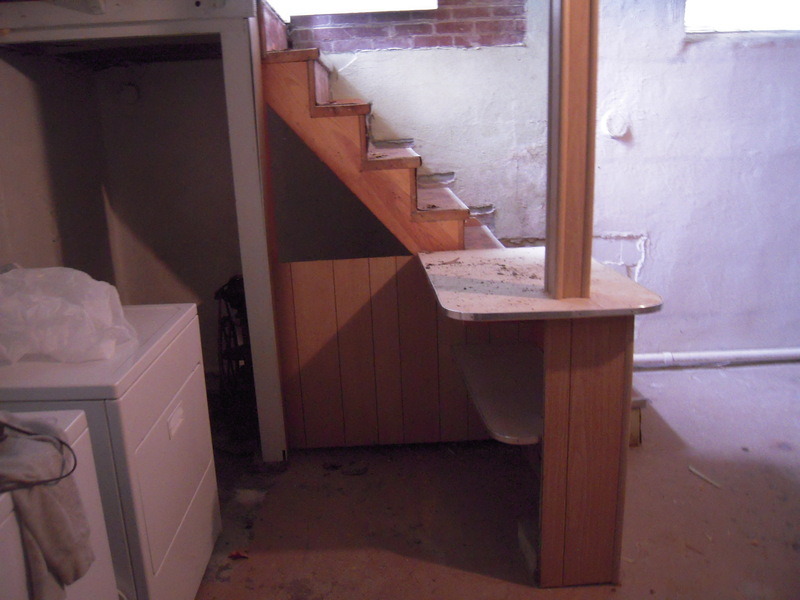 Again, before the staircase decided it needed a new look. 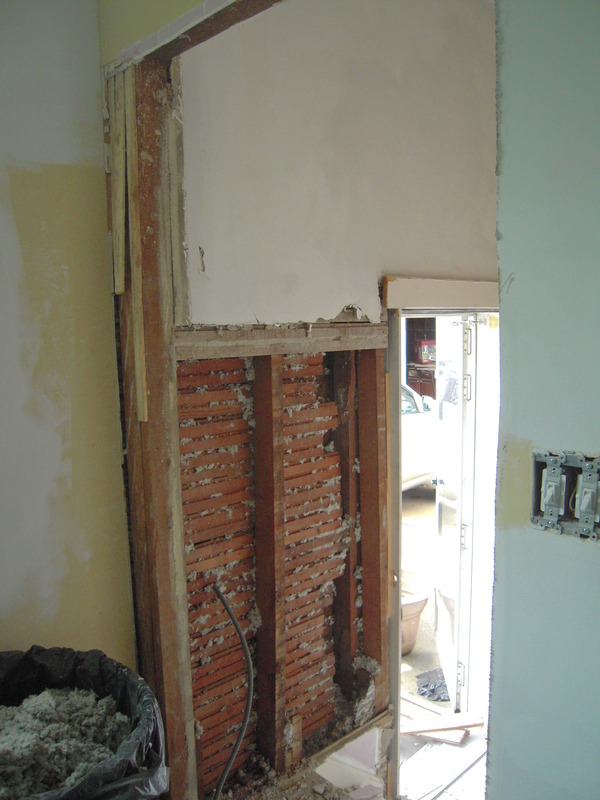 Yes, this was finished – and yes I tore it all out and did it a third time. More on that in a later post. Let’s say just for giggles we can steal 30″ or so up here – That’s what we need. We’ll start on the easy part first. 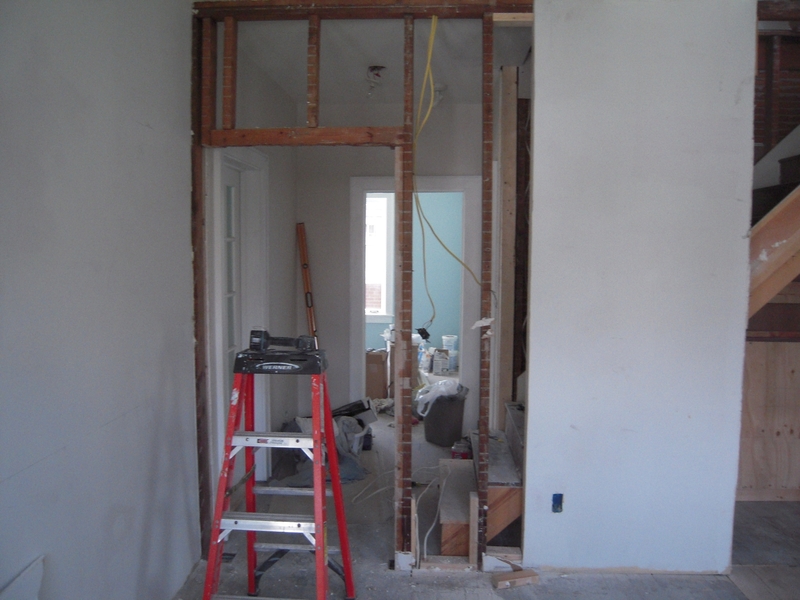 Here I’ve stripped drywall and the casing from the door and removed 7″ from the left side of the opening.This will allow for shifting the opening to the left and gaining the 6″ for the bottom of the stair. Sometimes I hear people comment “They don’t make em’ like they used to”. That may be true for some but not this particular ‘carpenter’ in 1935. Looks like he used a beaver to shave this “header” down to size. 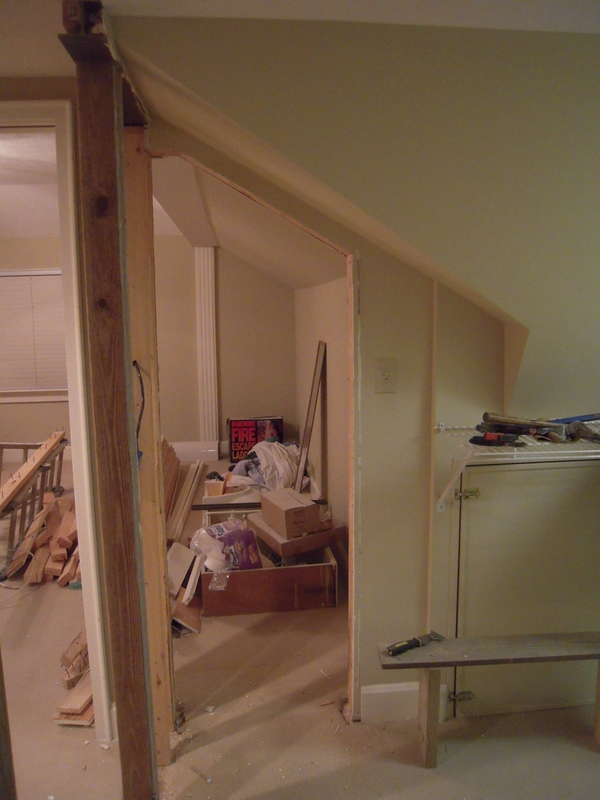 You can see the additional framing members for extending the wall at the stair landing. The top will be much more challenging. This is why. 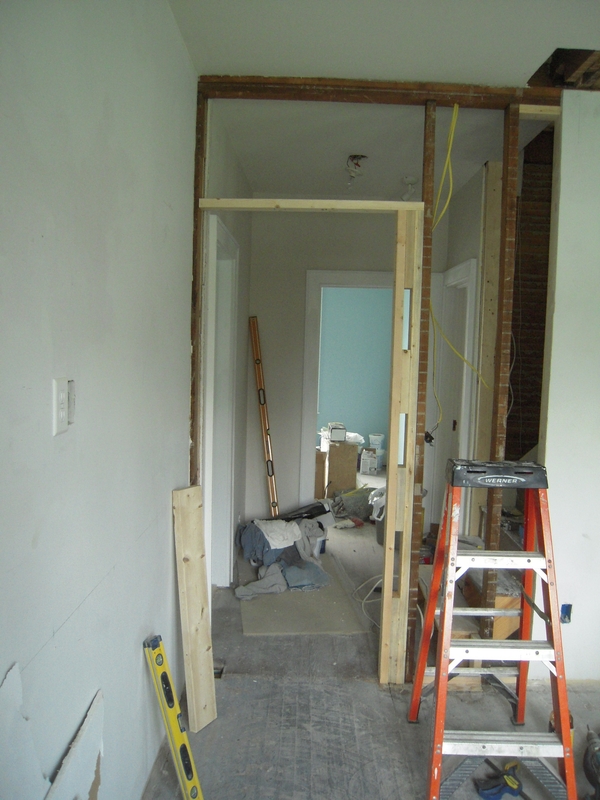 Here’s a side view of the upstairs closet looking into the bedroom with the door wall facing the staircase to the left. 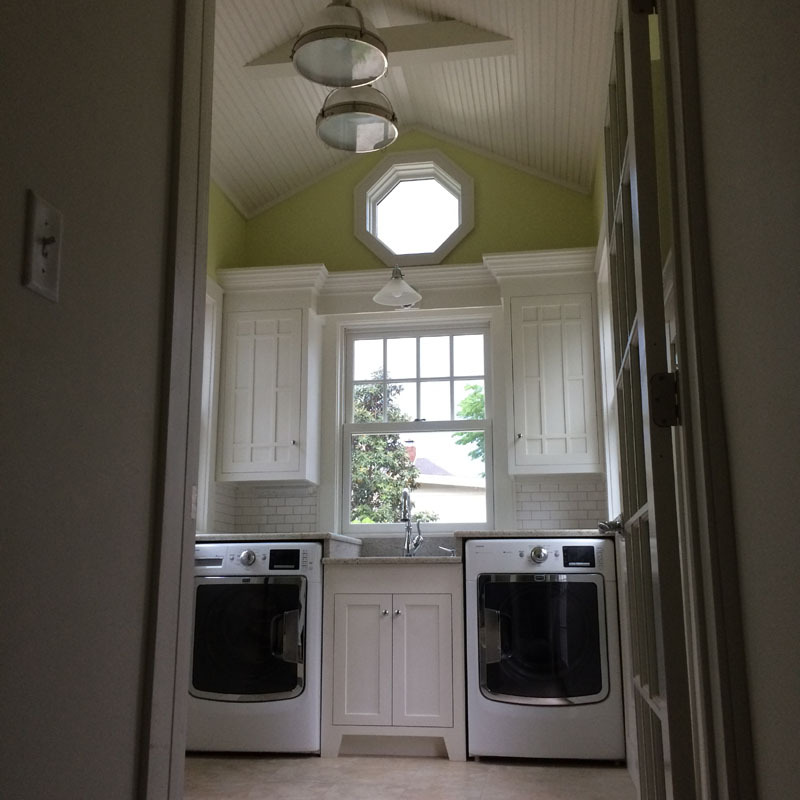 The problem is this is a 1 1/2 story Bungalow and there are height limitations at the top of the stair. 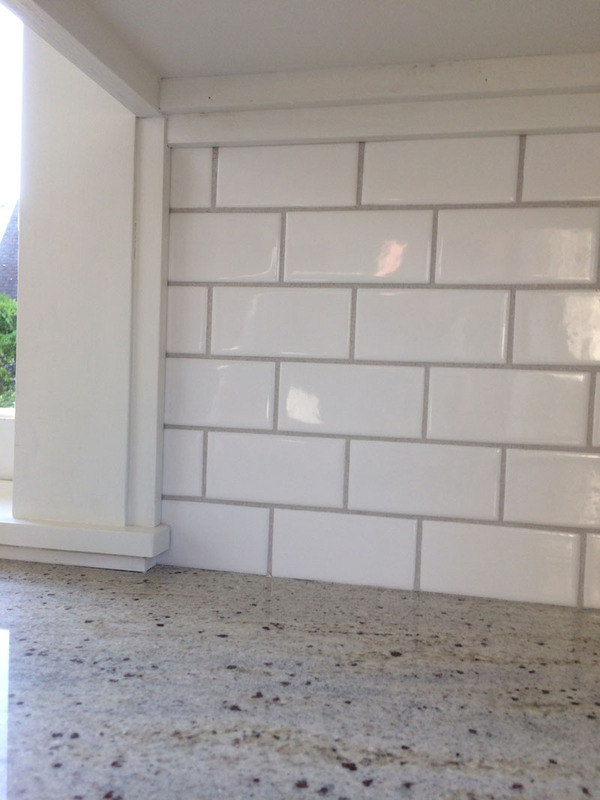 You can see the angle of the roof encroaching on the headroom. This will be tricky indeed. 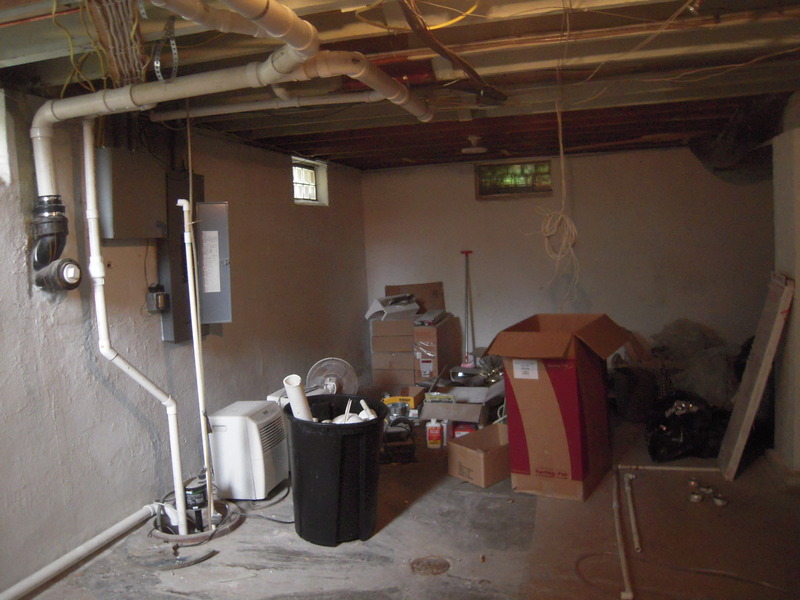 We will have to move the closet wall back 30″ or so and deal with the angles of the roof. 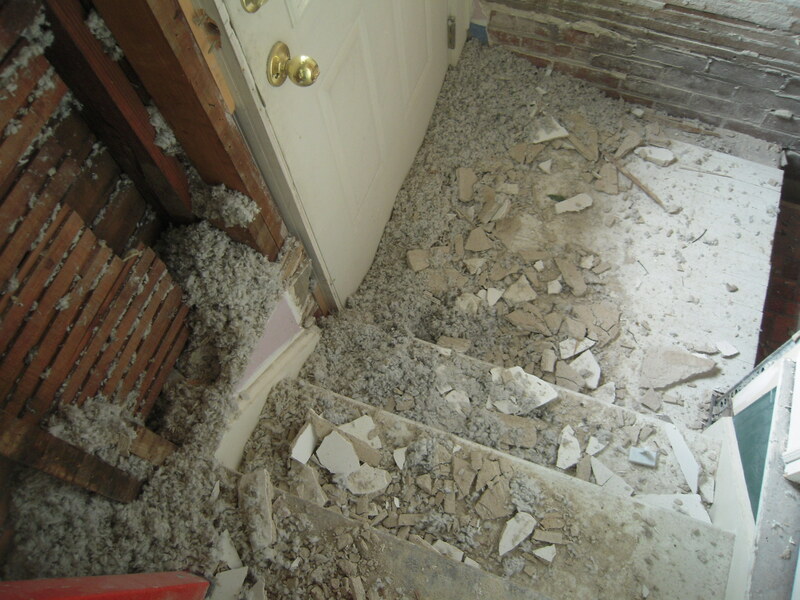 Let’s give it a rest and strip the stairwell. Time for some more doodling to make that staircase be all it can be.